To register a Limited Liability Partnership (LLP) a minimum of two persons are required over the age of 18 with one being an Indian citizen and resident. IndiaFilings offers a comprehensive llp accounting and compliance management solution starting at less than Rs.7899/- per year. IndiaFilings is the market leader in LLP registration services in India. In addition to LLP registration, IndiaFilings also offers a variety of business registration services like private limited company registration, one person company registration, Nidhi Company Registration, Section 8 Company Registration, Producer Company Registration and Indian Subsidiary registration. The average time taken to complete a LLP registration is about 15 - 20 working days, subject to government processing time and client document submission. Get a free consultation on LLP registration and business setup in India by scheduling an appointment with an IndiaFilings Advisor. Updated LLP registration process unveiled by the Ministry of Corporate Affairs with LLP RUN Name Approval procedure and details of processing under the Centralised Registration Centre. Documents required for LLP registration in India for Indian Citizens and NRI nationals along with details of LLP subscribers sheet. PAN and address proof of Partners is required to register LLP. LLP was introduced in the year 2010 in India to provide Entrepreneurs with an alternative to Partnership Firms. The purpose of introducing Limited Liability Partnership (LLP) is to introduce a form of business entity, which provides limited liability to the owners and at the same time relatively easy to manage. Acceptable Name for Company or LLP, as per Companies Act, 2013 and LLP Act, 2008. Procedure for checking name availability and formulating a unique name. Guide to LLP Registration for NRIs and Foreign Nationals. 100% FDI is now allowed under the automatic route for LLPs. IndiaFilings can help register a LLP. LLPs registered in India must file MCA annual return and income tax return each year. Failure to file MCA or tax return to lead to penalty and disqualification of Partners. IndiaFilings can help you prepare financial statements, file MCA annual return and income tax return for just Rs.7899. Class 2 digital signatures with 2 year validity on secure USB token. Upto 4 name options can be given in 1 RUN name approval request. Opening a current account for an LLP is easier when compared to opening of current account for a sole proprietorship firm or partnership firm as an LLP is a registered legal entity – recognized by law. Therefore, once a LLP is incorporated, a bank account can be opened in the name of the LLP with the incorporation certificate of the LLP and identity/address proof of the Partners. What is the capital required to start a Limited Liability Partnership? Can a LLP be incorporated for undertaking "Not-For-Profit" activities? No,one of the essential requirements for setting LLP is 'carrying on a lawful business with a view to profit'. Therefore, LLP cannot be incorporated for undertaking "Not-For-Profit" activities. Is an office required for starting a Limited Liability Partnership? Do I have to be present in person to incorporate a LLP? What are the documents required for incorporation of LLP? How long will it take to incorporate a LLP? IndiaFilings.com can incorporate a Limited Liability Partnership in 14-20 days. The time taken for incorporation will depend on submission of relevant documents by the client and speed of Government Approvals. 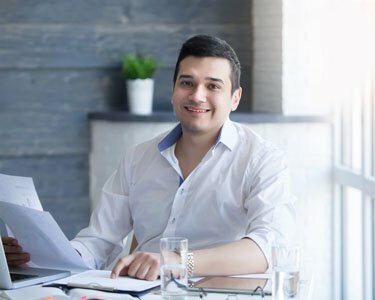 To ensure speedy incorporation, please choose a unique name for your LLP and ensure you have all the required documents prior to starting the incorporation process. Can NRIs / Foreign Nationals be a Designated Partners in a LLP? Yes, a NRI or Foreign National can be a Designated Partner in a Limited Liability Partnership after obtaining Designated Partner Identification Number. However, atleast one Designated Partner in the LLP must be a Resident India. Yes, Foreign Direct Investment (FDI) is allowed in LLP under the automatic route in sectors allowed by the Foreign Investments Promotion Board (FIPB). However, Foreign Institutional Investors (Flls) and Foreign Venture Capital Investors (FVCIs) will not be permitted to invest in LLPs. LLPs will also not be permitted to avail External Commercial Borrowings (ECBs).